The Empire State Building may be the iconic symbol of the golden age or the New York skyline, but it is the Chrysler Building that has all the charm. I love both buildings and all the great examples of art deco design on a grand scale. I have a collection of miniature buildings – mostly the Empire State and Chrysler Buildings (and Big Ben but that is a story for another time). 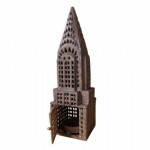 So you can image how thrilled I was to see this recently – a Chrysler Building lantern available from Fish Eddy. Nothing can put a smile on a child’s face faster than pulling out a puppet. I found these felt puppets (from Nepal ) and fell in love with their faces. 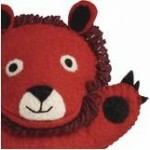 See the collection of felt puppets from Brooklyn 5&10 here. Check out cool product s from Brooklyn 5&10 here. Lost Cowboy is powered by	WordPress 5.0.4 and delivered to you in 0.882 seconds using 42 queries.